Elizabeth Warren strikes fear in the hearts of many on Wall Street. If the Democrats take control of the Senate on Tuesday, the liberal from Massachusetts will be newly-empowered to crack down on misbehaving banks and drug makers. Sure, the race for the White House is getting the most attention. But the Senate is up for grabs Tuesday, as competitive races in nine states will determine whether Republicans can hold on to power or if Democrats are able to win a slim majority. The looming presence of Warren is a big reason why many investors are also anxiously awaiting the outcome of the Senate race. Warren, whose star power is clearly on the rise, is not shy about flexing her muscle. Her epic takedown of former Wells Fargo (WFC) CEO John Stumpf is only one example. 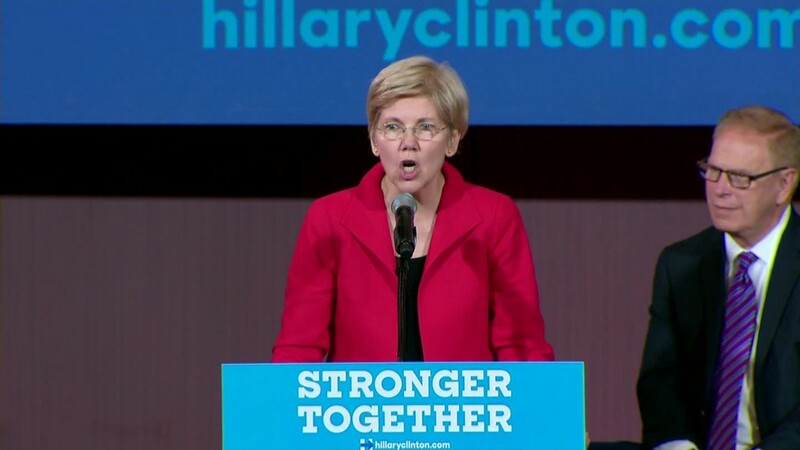 Warren draws big crowds and she has heavily campaigned for Hillary Clinton in the weeks leading up to the election. If Clinton wins, and the Democrats win enough seats to control the Senate, Warren's influence is only expected to increase. She hasn't been shy about taking on big banks and has even ripped into the SEC chief for being ineffective. Wall Street fears she would have a much bigger say on who gets to run powerful institutions like the Federal Reserve, Treasury Department and the SEC. "You could very well see a tug to the left on appointments," said Kristina Hooper, U.S. investment strategist at Allianz Global Investors. "Senator Sanders and Senator Warren aren't campaigning for Secretary Clinton for the hell of it. They want to extract their pound of flesh if she is elected." 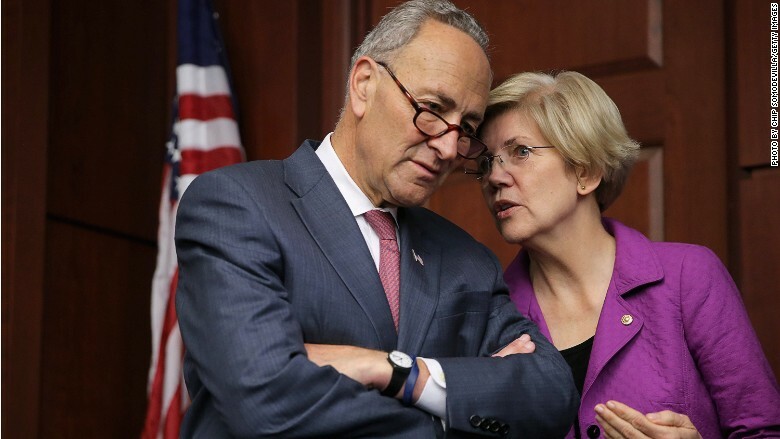 Elizabeth Warren whispers in the ear of Chuck Schumer, who is in line to become Senate majority leader if Democrats win control of the Senate. That's why Jaret Seiberg, analyst at Cowen & Co., argues that the "fight for control of the Senate may be even more important for financials" than the outcome of the presidential election. Seiberg argues this is very important for those concerned about overregulation of big banks. He pointed to the immense power wielded by Daniel Tarullo, a Federal Reserve governor, who has pushed for more aggressive regulation on big banks. Seiberg warns that if the GOP loses the Senate, Clinton may be pushed to "nominate those on the more progressive side of Tarullo." Warren didn't even wait for Election Day to pass before making her negative opinion on SEC boss Mary Jo White clear. Last month, Warren urged Obama to replace White as chairwoman of the powerful SEC and accused her of "ignoring the SEC's core mission of investor protection." "She hates our industry," Greg Valliere, chief global strategist at Horizon Investments, warned in a recent note. He called Warren a "genuine threat," and cited the fact that she is "electrifying" and "has an army of supporters." If Trump wins the White House, a Democratic Senate would limit the Republicans' ability to dismantle the Dodd-Frank regulatory regime. Yet a Democratic Senate could also help Trump if he tried to break up the big banks, as the GOP formally endorsed in its 2016 platform under Trump. All of this explains why some market strategists believe the U.S. stock market could enjoy only limited gains if Clinton wins but Republicans lose control of the Senate. Beyond banks, the drug industry is also nervously watching to see the outcome of the Senate race. First, a Democratic Senate would be more supportive of Clinton's proposals to allow prescription drug importation and let Medicare negotiate directly with pharmaceutical companies. Of course, those proposals would face opposition in the House, if it's still controlled by Republicans as many expect. However, Wall Street is also worried about the impact on drug prices. UBS said that many think a Democratic-controlled Senate will "investigate the industry, and push harder for legislation to curtail rapid drug list price inflation." Drug prices have been a lightning rod for criticism in recent months, especially from the likes of Sanders and other liberal lawmakers. Outrage was on full display earlier this year during the controversy over dramatic price hikes for EpiPens.